This ornament is special to me because I love stars on a tree, whether they are gold and shimmery or colorful. Stars on a Christmas tree remind me of the star of Bethlehem. You can use large metal stars or small ones to create this project depending on the size of tree that you have. If your star does not have holes on opposite points, you may have to use a drill to make holes before you begin your project. Some of the metal stars already have hangers on the back. Make a pattern by placing a piece of paper over the star and shape it around one side of the star, creasing the paper with your fingernail. Trace over the creases with a pencil to get sharp lines. Cut it out and place it over one section of the star to ensure that it fits. Trim it, if necessary. Cut out 5 pieces of one color of fabric. Turn the pattern over and cut 5 more pieces from the other fabric. Using a sponge brush or paintbrush, apply some Mod Podge over one of the sections and lay a piece of fabric over it, smoothing out any air bubbles with your fingers. Sometimes fabric will stretch when wet, so if it does not fit perfectly, don’t worry, you will trim off any excess later. Just be sure that the metal does not show. Complete one section at a time, alternating colors of fabric, until the entire star is completed. When dry, turn the star over and trim any excess fabric from the edges. 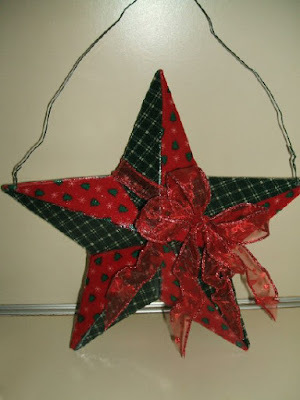 Turn star back over, and apply a generous amount of Mod Podge over the entire front side of the star. Be sure to smooth down any fabric that has lifted or puckered. The Mod Podge will be cloudy when applied, but will dry clear. When completely dry, spray star with clear acrylic gloss or use the brush-on type. This gives it a nice shiny look. Allow gloss to dry completely. Tie ribbon around star and tie into a bow. Trim any excess. Run a piece of wire through the holes on opposite sides of the star and it is ready to hang on your tree!